Beaumont researchers have created a new mode of proton therapy for lung cancer. Members of Beaumont Health’s proton therapy team presented research on this new treatment for patients with lung cancer at the European Society for Radiotherapy and Oncology meeting – ESTRO 37 Congress in Barcelona April 20-24. “The promising results might lead to interest and future development of the proton arc therapy technique," said Dr. Kabolizadeh. noting that Beaumont continues to be a center of new treatment development through research. Proton therapy is a high-tech alternative to X-ray radiation. A scanning beam of proton radiation with online image guidance offers greater precision to destroy cancerous cells, sparing adjacent healthy tissue with fewer side effects. Proton therapy uses positively charged atomic particles, traveling up to two-thirds the speed of light, to fight cancer. A cyclotron, or particle accelerator, creates protons from hydrogen molecules. The proton beam is sent to the treatment room through a transport system consisting of magnets, called the beam line, finally arriving in the gantry, a device that rotates around the patient. The beam is directed to the patient through a nozzle that targets the tumor. While proton therapy is not effective against all cancers, it is effective in treating many solid and localized tumors. Beaumont’s center is one of just 28 proton therapy centers in the U.S. 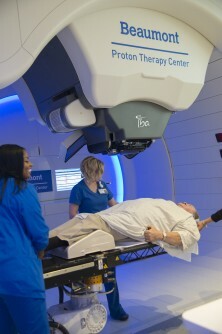 It is the only operational proton therapy center in Michigan. Beaumont doctors have treated or consulted with patients across Michigan and 11 other states since opening the Proton Therapy Center in 2017. Pencil Beam Scanning refers to the delivery of protons in a thin beam. Like a pencil, the beam uses back and forth motions to target the treatment area – the shape, size and depth. It “paints” a radiation dose on tumors layer by layer. Compared to X-ray beams, which pass through a patient, proton beams deliver targeted radiation to the tumor and then stop – resulting in no exit dose. Radiation oncologists at Beaumont are well versed in precise image guidance, having developed cone beam CT technology almost 20 years ago. Beaumont researchers invent new mode of proton treatment for lung cancer. Appl Rad Oncol.